I inherited an African Milk Tree from a friend and it's been so happy, it's grown about 2 feet! 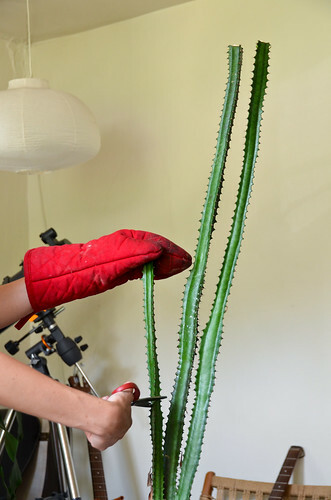 However, a four foot tall skinny cactus that sprouts toxic milk juice is sort of an apartment hazard and so recently I set about chopping it down a bit and propagating it into additional plants for more friends. 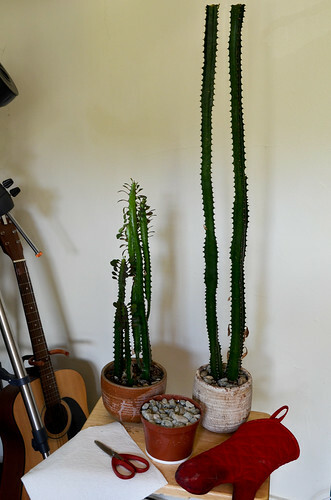 These guys are sooooo low maintenance (seriously, if you water more than once every two weeks, it'll get mad at you), so I want to share the awesomeness. 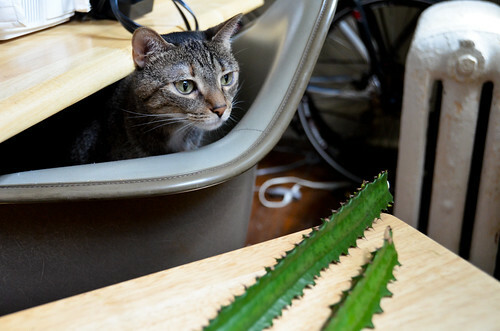 'Turns out, it's pretty much the same way you propagate other succulents, just with more thorns, toxic juices, and wobbly heights. I actually should've cut these down to about 6 inches each, because as it is, the new branches they'll sprout will make them seriously top heavy. Oh well, they'll be someone else's problem then!! It's best to do this in spring or early summer. Your plant will thank you. 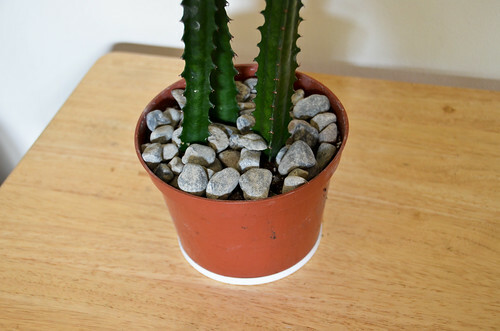 Supplies: Over-sized African Milk Tree, Oven mitt, Sharp scissors, Paper towel, Plant pot with dirt (optionally, you could just plant the newly cut stalks into your old pot, thereby increasing the density of your plant without the need for a second pot). 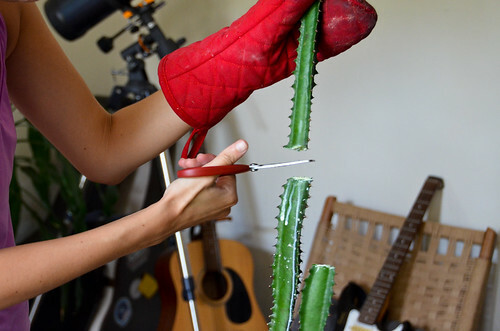 Cut through stalk, using oven mitt to prevent top from dropping. 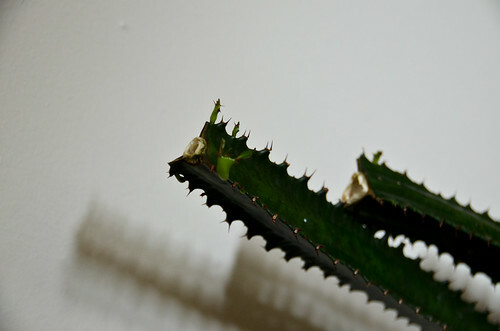 The sharper the scissors/knife, the less scarring of the plant there will be. Avoid touching the toxic milk juices as much as possible. Wash your hands frequently, and do not touch your face! 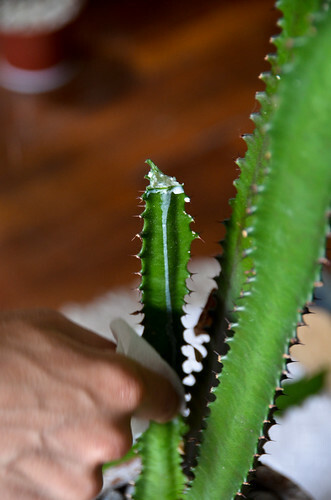 Wipe toxic milk juices off plant with damp towel. 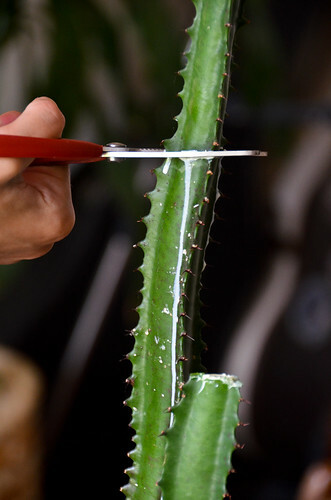 A damp towel will also help to stem the plant's bleeding. 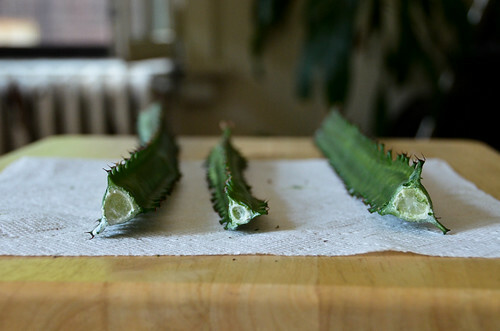 Place cut stalks somewhere to dry 3-10 days, until cut end heals. Out of direct sunlight. Keep away from animals and children. 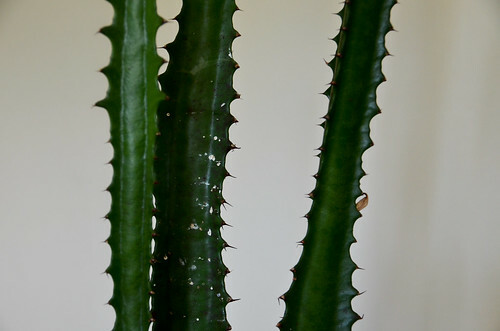 The thorns and the toxic juices aren't exactly good for anyone. After 3-10 day wait, plant cut stalks 1-2 inches into small pot. Do not water for several days. African Milk Trees have really shallow roots, and so they actually prefer really small pots, smaller than the ones I'm using to be honest. 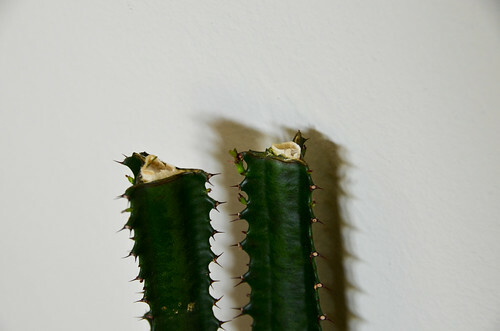 Before cutting and propagating the [original] plant again, ensure it's begun sprouting new branches at its cut (shown below). 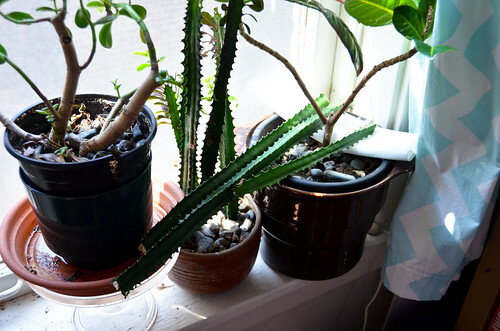 For new plants, don't propagate until they've had a bit of growth (i.e., developed some roots). This is such a cool idea!!! Love it! my tree is over 71/2 feet tall. Time to cut but did not know how much time to allow before replanting of cutting. You gave me everything I needed about this 30 something year old wonderful tree in my house. Gorgeous. 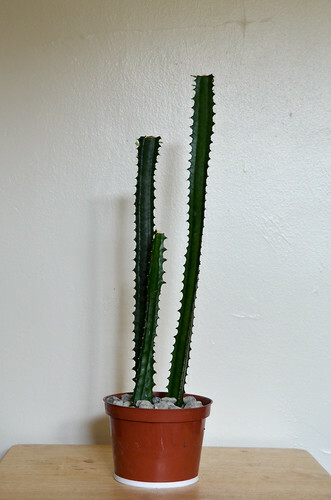 I have a euphorbia trigona 8’-0” tall and probably 4” in diameter. it is three stems in one pot. 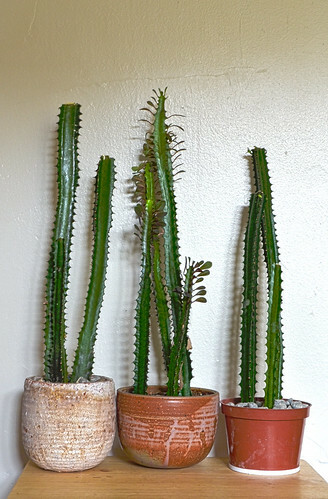 I want to cut the stalks off approximately halfway and replant the tops. 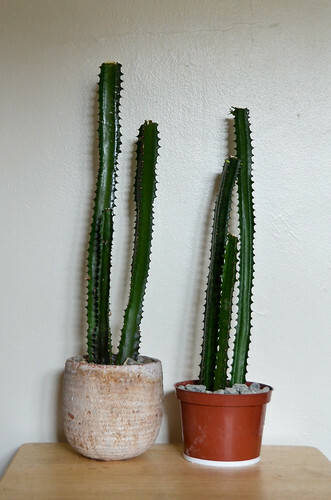 What size pots should I use for the tops at approx 3-4’ tall and 4 inches in diameter?